Numbness in the left arm or right arm can be caused from trauma from an injury, compressed nerves or overuse of the upper arm muscles. Other causes of upper arm numbness and tingling include a pinched nerves within the neck or a mini stroke. Read below for more information and how to find relief for an upper arm going numb. Numbness in one upper arm can be described as a loss of sensation or tingling. Not being able to completely feel the upper arm or move it properly despite stimulus can understandably cause feelings of nervousness or discomfort. Causes can be related to injury or underlying medical conditions that can be properly identified by your medical provider. The upper arm is controlled by a complicated branching system of nerves called the brachial plexus . This plexus of nerves starts from the cervical spinal cord, travels down the neck, over the first rib, and into the armpit to provide innervation to not only the arm and hand but also the chest and shoulder. 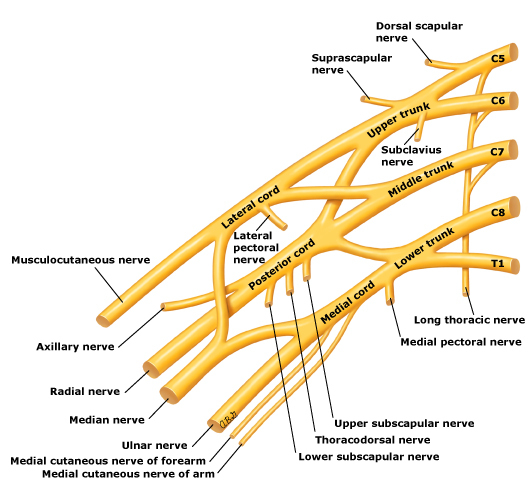 See an image of the brachial plexus here and here. Sensation (also called cutaneous innervation) of the upper arm is primarily controlled by a branch of the brachial plexus called the axillary nerve. Part of the area over the shoulders is also controlled by supraclavicular nerves these are not part of the brachial plexus but also branch from the cervical spinal cord. See an image of this innervation relationship here. It is important to follow-up with your healthcare provider if you are experiencing any of the above symptoms. Numbness in the upper arm can have a variety of different causes and signal an underlying condition that requires prompt treatment. Upper arm numbness is the result of injury, compression or irritation primarily of the axillary nerve, but such symptoms can also be caused by injury, compression or irritation of the other nerves in that area . Thus, causes that result in upper arm numbness are varied but can be divided into the following categories. Traumatic causes of numbness in one upper arm may be related to the following. Direct injury: Direct injury to the muscles and bones of the upper arm in the form of dislocations, fractures, and even sprains can also result in injury to the nerves of the upper arm resulting in numbness and other associated symptoms such as tingling and pain. Compressive injury: Surprisingly, the axillary nerve is very susceptible to compression from non-traumatic causes. For example, compression of the brachial plexus, and in turn, the axillary nerve by anatomical structures in the area (such as the first rib or clavicle) can result in a constellation of symptoms including numbness of the upper arm . This is known as thoracic outlet syndrome [3,7]. Entrapment: Very rarely, the axillary nerve may become trapped as it runs through a small space (the quadrilateral space) made by the teres minor muscle at the top, the humerus bone on one side, the long head of the triceps muscle on the other side, and the teres major muscle at the bottom. 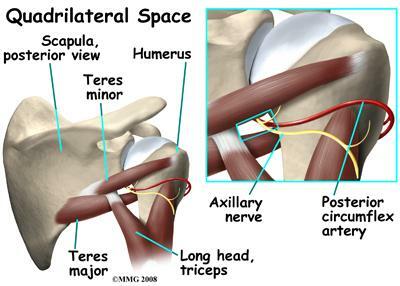 See an image of this space and its relationship to the axillary nerve here. Causes related to systemic disease may include the following. Metabolic: Dysfunction in the processes that your body uses day-to-day, for example, glucose and insulin dysregulation in diabetes, can damage the peripheral nerves causing numbness in one upper arm and other parts of the body (this condition is known as peripheral neuropathy) [4,5]. Tumors: Very rarely, cancerous and noncancerous growths in the body can directly grow and compress nerves in the upper arm, including the axillary nerve. The list below shows results from the use of our quiz by Buoy users who experienced numbness in one upper arm. This list does not constitute medical advice and may not accurately represent what you have. Be mindful of sleeping positions: An activity as simple as sleeping on the back with the arms above the head can temporarily compress the axillary nerve, resulting in the familiar sensation of the "arm falling asleep." Try to be cognizant of how you sleep and make yourself as comfortable as possible. Avoid repetitive motions or cramped positions: This could lead to numbness if unnecessary pressure is put on your shoulders. Other tips: Often relief can be found in improving your posture, buying a support for your back while typing, or taking breaks throughout the day in order to lessen compression and irritation of the nerves in your arms/shoulders. Regular exercise: Maintaining an optimal weight with exercise as well as a balanced diet can prevent and also control metabolic diseases such as obesity and diabetes. Medications: Your physician may be able to give you a prescription that can treat tingling and other symptoms related to numbness in the upper shoulder. Physical therapy: If your shoulder numbness is due to anatomical conditions or trauma that cause compression of the nerves and blood vessels leading to your arm and hand, your physician may suggest therapy to help take the pressure off of these body parts, which also may improve your range of motion and posture. If you experience any symptoms of speech difficulty, facial drooping, or weakness to the point you cannot raise your arm, call 911 immediately. These could be signs of a stroke. Here are some frequently asked questions about numbness in one upper arm. Will the numbness in my upper arm affect how I use my arm/hand? The numbness in your upper arm may be associated with problems moving the arm and hand. The axillary nerve is both a motor and sensory nerve, so it provides innervation that controls movement in addition to sensation. You may have some weakness and difficulty externally rotating or abducting the shoulder, but since there are other muscles that help with these movements, your difficulty should not be severe. If compression or injury of the brachial plexus results in injury to other nerves, you may also experience difficulties moving the hand. Why am I only feeling numbness in one arm? You are only feeling numbness in one upper arm because the nerve in that specific arm has been affected whereas the nerve in the other arm has not. Is numbness in one upper arm life-threatening? Usually, numbness in one upper arm is not life-threatening, especially if it is related to compressive etiologies. One life- and/or limb-threatening condition to be mindful of is compartment syndrome a situation in which increased pressure within a confined space can lead to an inadequate blood supply to an organ. This can also present with numbness, but usually, compartment syndrome is associated with severe trauma and symptoms such as paralysis, lack of pulse, and changes in the color of the extremity. This condition needs immediate medical attention. Will the numbness spread from my upper arm to other parts of my arm or upper body? If your symptoms are due to compression of the axillary nerve via the brachial plexus, your symptoms may spread to other parts of the arm and hand depending on which other branches and nerves of the plexus are affected. How long will the numbness last? Decompression of the axillary nerve from non-traumatic causes usually results in very fast relief. Decompression in this context can be attained by simply moving the arm from the offending position or even shaking the arms out.